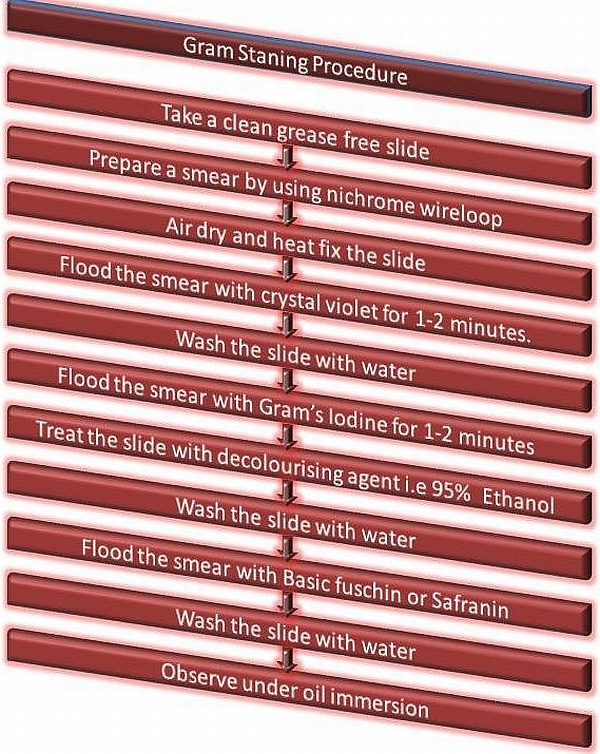 Take a clean grease free slide. Prepare a smear from a bacterial cell suspension on a slide by using nichrome wire loop. Flood the smear with a primary stain that is Crystal violet and allow it to react for 1-2 minutes. After Crystal violet treatment water wash treatment is given to the slide. Further, the smear is treated with the mordant that is Gram’s Iodine for 1-2 minutes. Excess Gram’s Iodine is removed and the and the slide is further treated with a decolourising agent that is 95 % Ethanol. After Ethanol treatment the smear is water washed and flooded with counterstain that is Basic fuchsin or Safranin for 1-2 minutes. Finally, the slide is washed with water, air dried and observed under oil immersion. Cells stained with crystal violet appear violet colour are Gram-positive cells. Cells stained with counterstain i.e Basic fuschin or safranin appear pink in colour are Gram-negative cells. Crystal violet – It is a primary stain and a basic dye it stains all micro-organisms. Gram’s Iodine – Gram’s Iodine acts as a mordant and it forms a complex with crystal violet that is CV-I complex.This complex increases affinity between cell and stain. 95% Alcohol (95% Ethanol) – It is a decolourising agent as well as a lipid solvent.It tries to decolourise the cell by removing the CV-I complex from the cell. Basic fuschin or Safranin – It acts as a counterstain. It stains the cells that are decolourised by alcohol.Only Gram-negative bacteria get decolourise and this counterstain gives pink colour to these cells. When a smear is stained with crystal violet it stains all cells to violet colour. After application of Gram’s Iodine, its molecules acts as a mordant and form a crystal violet – Gram’s Iodine complex that is CV-I complex. After CV – I complex formation this smear is subjected to decolourising treatment by using 95% Ethanol for 30 seconds. The gram-positive cell has 1 to 4 % of lipid content due to low lipid content the cell get dehydrated by alcohol treatment and its pore size decreases so CV – I complex is trapped inside the cell. Peptidoglycan layer account about 40 to 90 5 of the dry weight of Gram-positive cell so due to extremely dense cross-linkage CV – I complex is trapped inside the cell. The gram-positive cell contains Magnesium ribonucleate so this compound Magnesium ribonuclease molecule forms a covalent bond with CV – I complex and thus it doesn’t allow CV – I complex to come outside the cell. The gram-negative cell contains 11 to 20 % of lipid content when Gram-negative cells are suspended in alcohol it dissolves the lipid and thus CV – I complex comes out. Peptidoglycan content in Gram-negative cell wall is 5 to 10 % so due to less amount of cross-linkage CV – I complex comes out easily. Gram-negative cell lacks Magnesium ribonucleate molecules so CV – I complex is extracted easily from the cell. 7. The cells which get decolourised by alcohol take the counterstain and appear pink in colour these cells are Gram-negative cells. 6. After decolourisation treatment, the smear is treated with counterstain i.e Basic fuschin and Safranin. Gram staining is a basic technique used for identification and classification of the cell. It is a useful technique in the diagnosis of the causative agent of a clinical infection. It is also helpful in studying morphological characters of cells. Gram positive bacteria – Bacillus, Staphylococcus, Streptococcus, Micrococcus etc.